So everyone knows that chocolate isn’t good for dogs thanks to Oreo, although you really shouldn’t let Fido drink your milk because cats and dogs are generally lactose intolerant, but did you know that just 7g/kg of cooking chocolate can be dangerous because of it’s higher concentrations of theobromine, that’s the component that’s toxic to your pets. Many people also know that paracetamol is toxic to cats. Because they lack the enzymes to process the drug, as little as half a tablet can cause fatal liver failure! But there is a surprising number of household substances that are toxic to your pets that most people don’t know about. Special warning for Permethrin, which is an ingredient in some dog spot-on, collar and shampoos for flea and tick treatment and prevention. These products are highly toxic to cats if applied to cats or even from close contact with dogs that have been treated with exposure usually coming from cuddling with, or especially grooming them! Garlic, onions, chives and leeks, with garlic being the most potent, can cause haemolytic anaemia, which literally causes the red blood cells to burst. Potato peelings, green potatoes, rhubarb leaves, green tomatoes and philodendrons (a common household plant) all contain oxalates which are insoluble crystals which cause local irritation in the mouth and throat, but even more concerning is the soluble oxalates in rhubarb leaves which are absorbed into the body affecting the electrolyte balance and can also cause kidney failure. Nutmeg actually contains Myristicin, an MAOI anti-depressant, which in small doses has no effect on humans, but can be fatal to animals. Signs include tremors, seizures and other central nervous system damage. Grapes, sultanas and raisins, even in small amounts can cause kidney failure with symptoms including lethargy and vomiting. 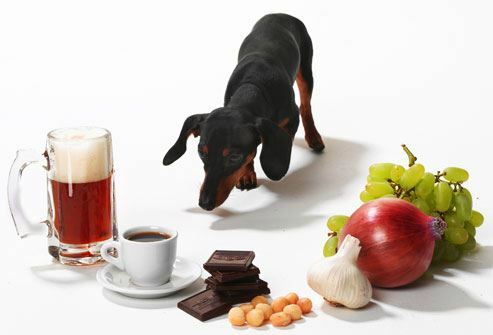 The caffeine in coffee, chocolate and coke may give you a great pick-me-up, but it’s not so great for your four legged friends, causing tachycardia, restlessness, rapid breathing and muscle tremors. Macadamia nuts can be fatal, causing illness from as little as six nuts, with symptoms including vomiting, lethargy and inability to walk. The toxicity is worse if it is combined with chocolate. Apricot and cherry, pits, leaves and stems contain cyanide, which is toxic, causing dilated pupils, difficulty breathing, shock and death. Xylitol is a substance found in sugar free lollies and chewing gum that when ingested causes an insulin increase resulting in hypoglycaemia (low blood sugar), seizures and liver failure. Homemade playdough, made with large amounts of salt (1 cup salt to two cups flour in some recipes) can be highly toxic, causing salt poisoning with vomiting, diarrhoea, inappetance, lethargy, seizures and death. Wild mushrooms, which sometimes come up in the backyard after rain, or when you’re out on a walk can be as toxic to not just humans, but animals too, causing liver or kidney failure or central nervous system damage, seizures, coma and death. Lillies are common in floral arrangements, but they are highly toxic to cats, with just 2-3 leaves causing liver failure. In dogs they tend more to cause gastrointestinal symptoms. Brunfelsia, commonly called yesterday, today, tomorrow is a pretty shrub, with purple and white flowers often found in gardens. While pretty, the leaves, flowers and stems, are toxic to dogs resulting in vomiting, difficulty walking and seizures. Other household plants that can harm your animals include aloe vera, cyclamen, rhododendrons and azaleas, daffodils and crocuses. You may wonder if your cats or dog would really eat some of these, but have a look at the radiographs from the “They ate what?” competition and you’ll see they really do eat anything. 43 and a half socks, 5 rubber ducks, 104 pennies, a pocketknife just to name a few. Cats and dogs, lacking opposable thumbs, tend to explore their environment with their mouths and either intentionally or not, ingesting the items they are investigating. Pets aren’t just small humans, their body systems are different to ours, which is why not everything we eat, they can too. So think twice next time Tiger is meowing at you or Fido begging at the table. Additionally, cats spend a lot of time grooming themselves, so if they get something on their coat they are going to end up ingesting it. Don’t think that just because your cat or dog ate one of these things once that it was okay as some of these things may have a cumulative effect, be stored in the body or be doing damage that you can’t see. Did you know that 75% or more of kidney function may be gone before your pet shows any symptoms? Unfortunately for many of these toxins supportive care is the only treatment option and for your pet to have the best chance of survival they need to get to the vet as soon as possible after ingestion, sometimes by the time you notice that something is wrong it might already be too late. So make sure that you have emergency contact numbers available as these incidents always seem to happen late at night, on a weekend, or when you’re pet sitting someone else’s animals!